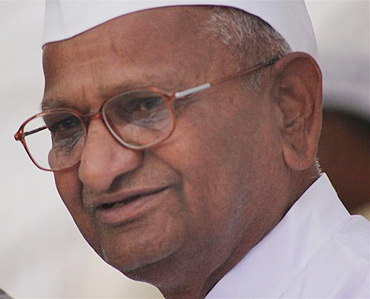 Anti-corruption activist Anna Hazare on Wednesday shot off a letter to Prime Minister Dr Manmohan Singh, slamming the reaction of his government and the Congress to his indefinite fast on Lokpal Bill issue, and urged him to show courage to take unprecedented steps to fight the menace. Responding to Congress' criticism that his protest was "premature", 72-year-old Hazare said authorities resort to "malicious slandering" whenever cornered and asserted that he was not a kind of person who could be "instigated" into going on an indefinite fast. He alleged that "their spokespersons are misleading the nation". Hazare, who launched his fast-unto-death on Tuesday in New Delhi, told reporters that he was willing to join a committee on the bill issue only if Congress chief Sonia Gandhi was a member of it, maintaining that any other such body would lack powers. Referring to criticism of his protest, Hazare said in the letter, "Dear Manmohan Singhji, this is an insult to my sense of wisdom and intelligence. I take advice from many friends and critics but do what my conscience directs me to do." "It is my experience that when cornered, governments resort to such malicious slandering. I am pained that the government, rather than addressing the issue of corruption, is trying to allege conspiracies when there are none," he said. In the letter, Hazare said the activists were not asking for accepting the Bill drafted by them but create a "credible platform" -- a joint committee with at least half members from civil society. "Your spokespersons are misleading the nation when they say that there is no precedent for setting up a joint committee. At least seven laws in Maharashtra were drafted by similar joint committees and presented in state Assembly," Hazare wrote. "Even at the Centre, when 25,000 tribals came to Delhi two years ago, your government set up a joint committee on land issues within 48 hours. You (Singh) yourself are the chairperson of that Committee. This means the government is willing to set up joint committees on all other issues but not corruption. Why," he asked in the letter. Addressing the press at the protest site at Jantar Mantar, Hazare said there is a talk of joint committee but they are constituting such a committee without any powers. "Is Sonia Gandhi in there? We will not go to any committee which does not have any powers. Maharashtra Chief Minister Prithviraj Chavan requested me to attend the committee. If Sonia is ready to attend the meeting, we are ready. If she is not ready, why should we go," he said. 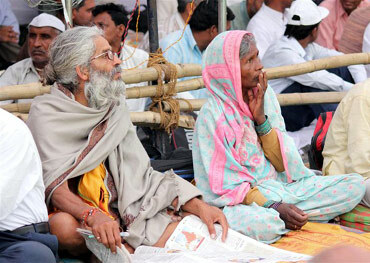 Hazare, however, said Dr Singh is a "good man" who is not tainted by corruption. "Remote control se gadbadi hote hei. (The problems are created when a remote control operates. )," he said. On questions about Agriculture Minister Sharad Pawar whom he had criticised on Tuesday, Hazare said the question was not whether Pawar is removed or not from the Group of Ministers on corruption issue. 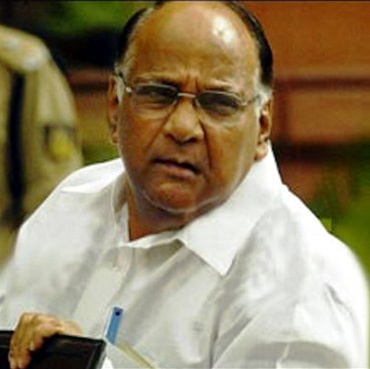 "If Pawar is removed, his brother will come there. What we need is not a committee of ministers. We need a committee involving public," he said. 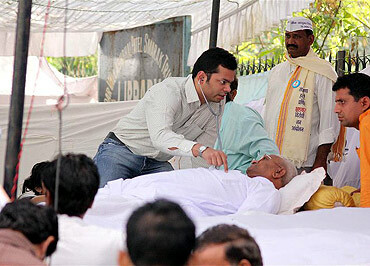 Hazare said he was ready to die for his cause. "Some people have given contract to kill me. Somebody has given Rs 30 lakh to kill me. But they say they will not kill Anna but they say they will kill Anna's men," he claimed. Asked whether he and his supporters will support the government if they decide to bring the Lok Pal Bill in Monsoon session, Hazare said they are ready for it. "But tell us what is in this bill. They will make a golmaal draft. They will cheat us. We repeat our demand for a joint committee," he said. Countering allegations that he had shown impatience, Hazare said in the letter to Dr Singh that every government has shown "complete insensitivity and lack of political commitment" to tackle corruption. Hazare said, "Sixty-three years after independence, we still do not have independent and effective anti-corruption systems. Very weak versions of the Lok Pal Bill were presented in Parliament eight times in last 42 years. Even these weak versions were not passed by Parliament." "This means, left to themselves, the politicians and bureaucrats will never pass any law which subjects them to any kind of objective scrutiny. At a time when the country has witnessed scams of unprecedented scale, the impatience of the entire country is justified. And we call upon you, not to look for precedents, but show courage to take unprecedented steps."